Riverside Five - Pool. Dock. Views of Waterway. Fast Walk to Beach. 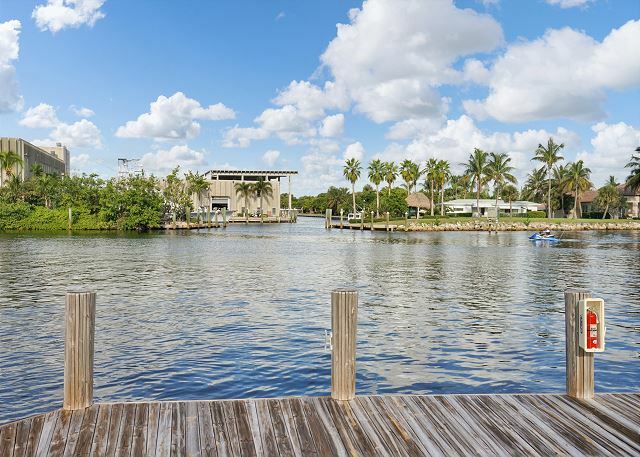 The dock wraps around the property and can accommodate boats of several sizes at $50 per night. 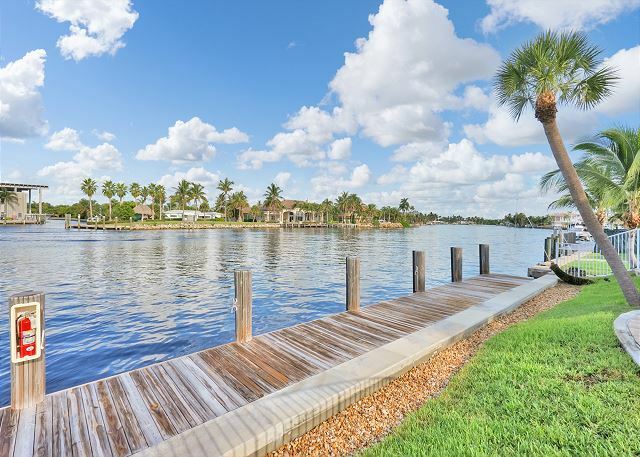 Watch the glittering water from your dock and pool deck area. Take a ride along a party boat or enjoy the parade of boats day and night. From the living room, you can gaze out to the water from every window. From the living room, you can gaze out to the water from all directions. The living room includes a sectional sofa, leather chair, and flat-screen TV. 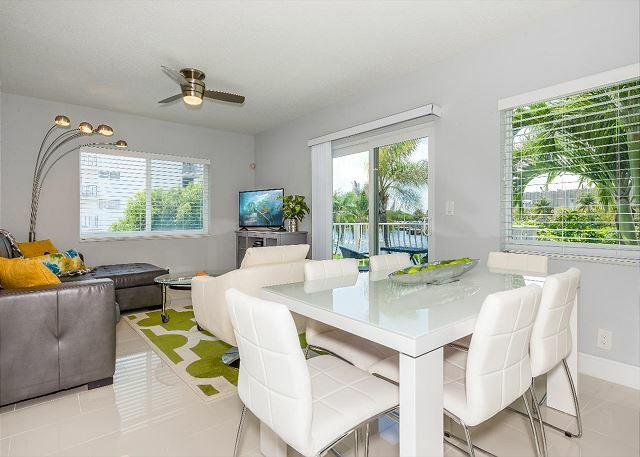 Whether you are eating at the dining room or relaxing in the living room, the water views are everywhere. A sleeper sofa comfortably sleeps two in the living room overlooking the water. 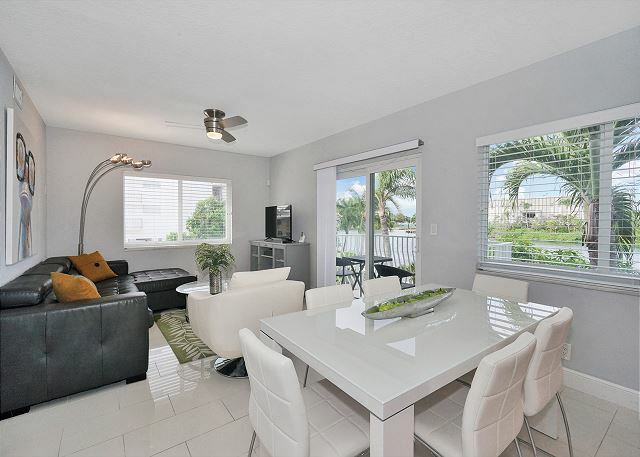 The combined dining and living areas allow entertaining easy and comfortable. 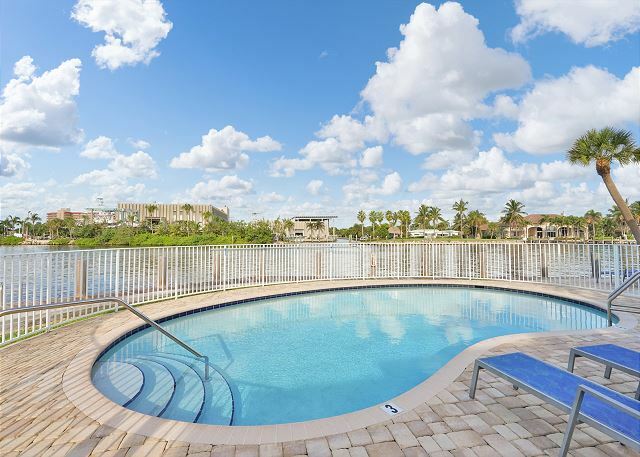 Everywhere you look you will have an incredible view of the pool and Waterway. The sleek dining table seats 6 easily. 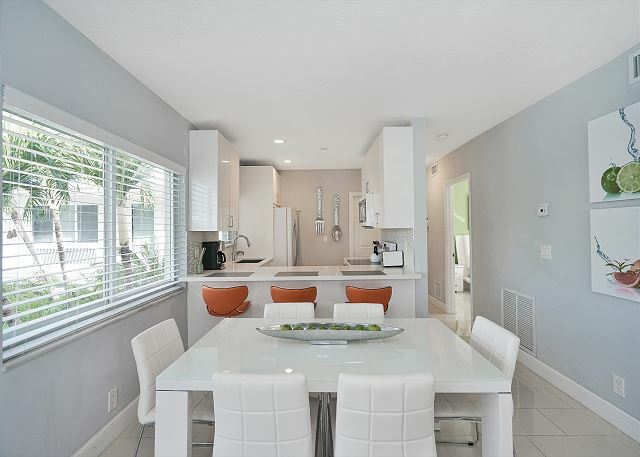 The dining area is open to the kitchen and eat-in breakfast bar. 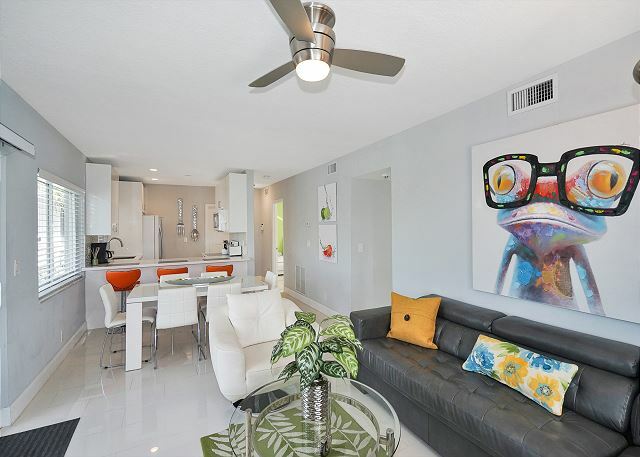 White décor offers chic contrast to the funky artwork. Sit at the bar and sip a cup of coffee while the morning sun streams in. The kitchen has everything you need to prepare meals at home. From the kitchen, you can see out the window and over to the living and dining areas. 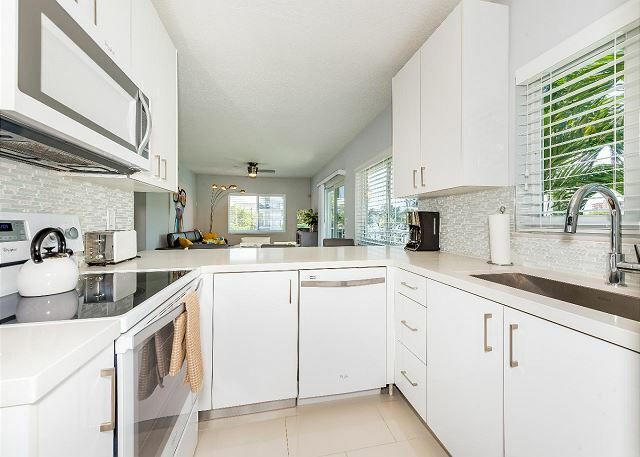 The sleek white cabinets and appliances give the kitchen a modern look. 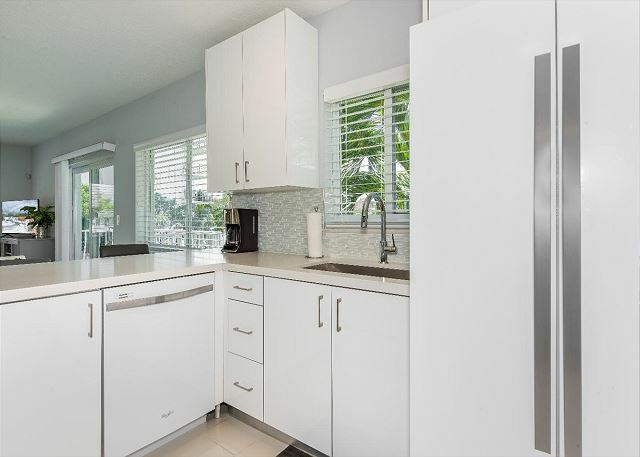 The modern white kitchen has top-of-the-line appliances. 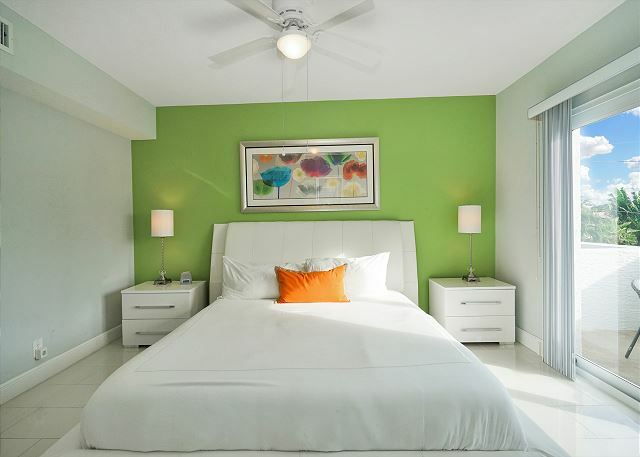 The lime-green accent wall behind the king bed adds a pop of color. 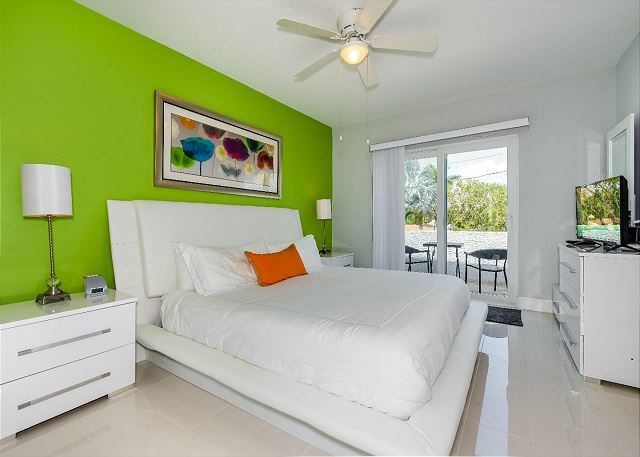 Master Suite is colorful and leads out to the balcony that overlooks the water. 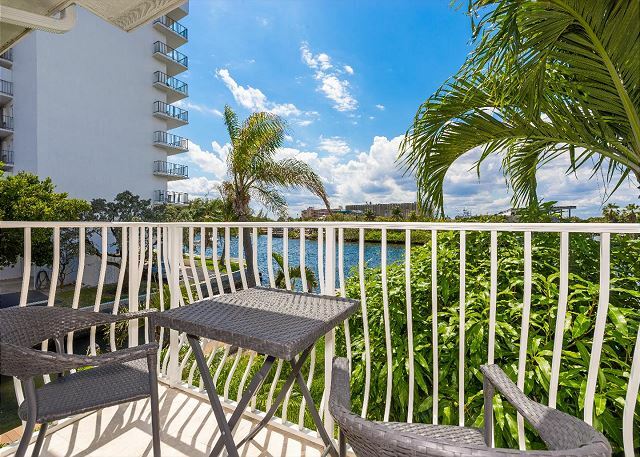 Glass sliding glass doors leads you to a private balcony overlooking the Waterway. 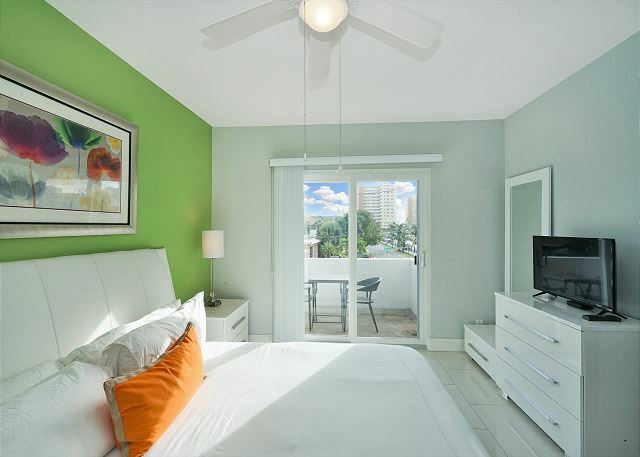 From the king size bed in the master suite, you have a view of your private balcony. 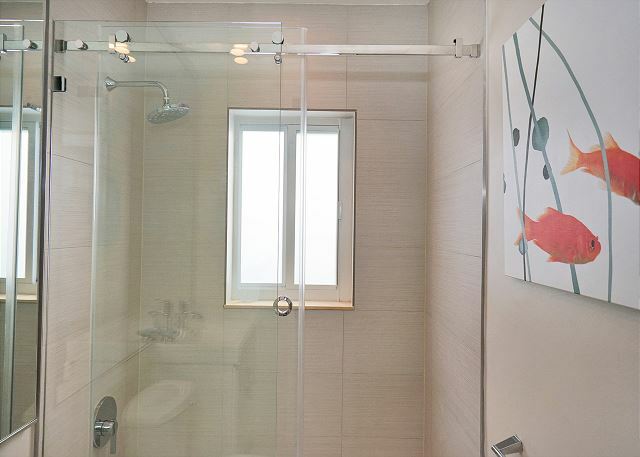 The en suite master bathroom has a seamless glass walk-in shower. 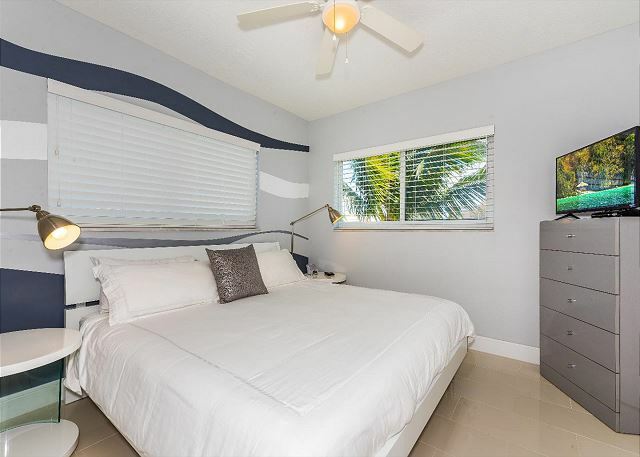 The second bedroom features a king bed, flat-screen TV, and water views. 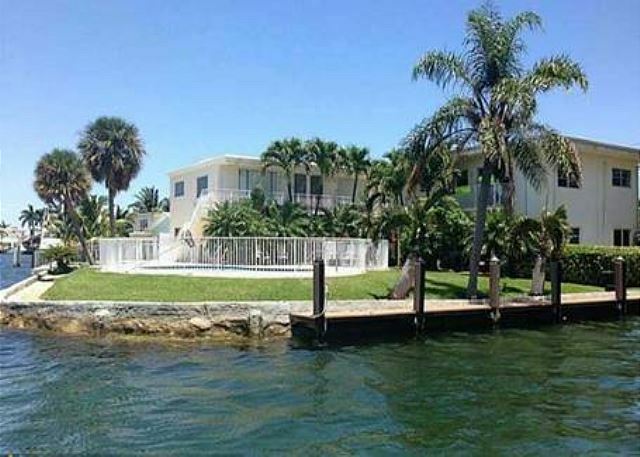 Big glass windows afford sparking views of the Intracoastal. 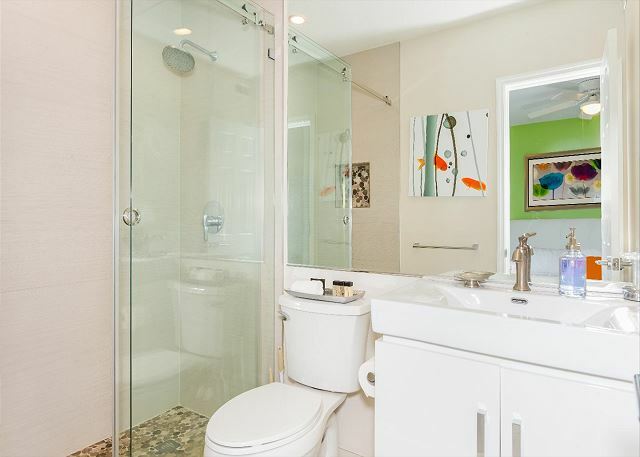 The guest bath has a tub/shower combo and is convenient for everyone. 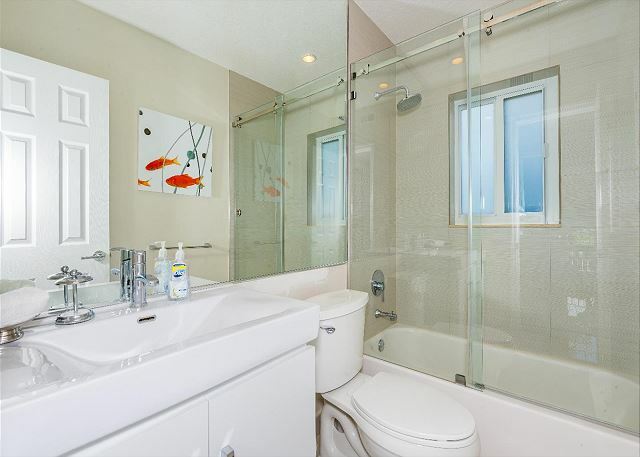 The combo tub and shower is perfect for pampering yourself after a full day at the pool. 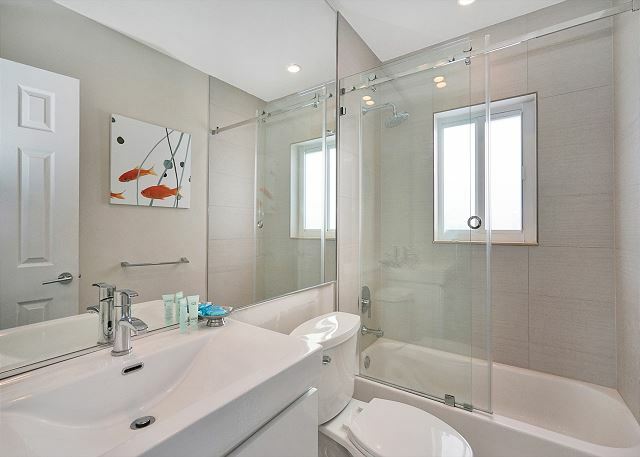 The second bathroom has seamless glass doors perfect to allow the sun to shine thru. 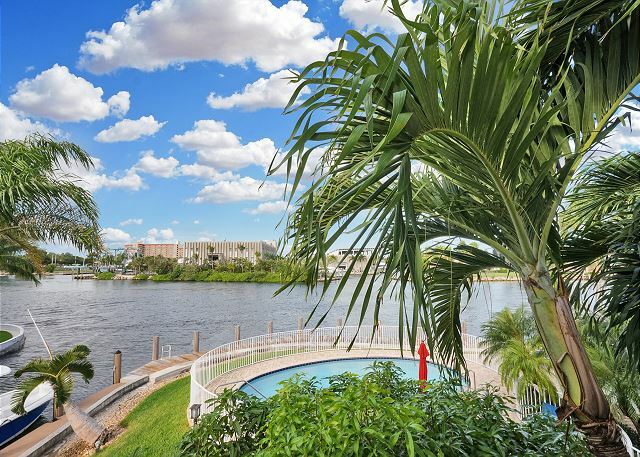 The second floor balcony has direct views of the Intracoastal Waterway. The private balcony sits two and overlooks the Waterway. 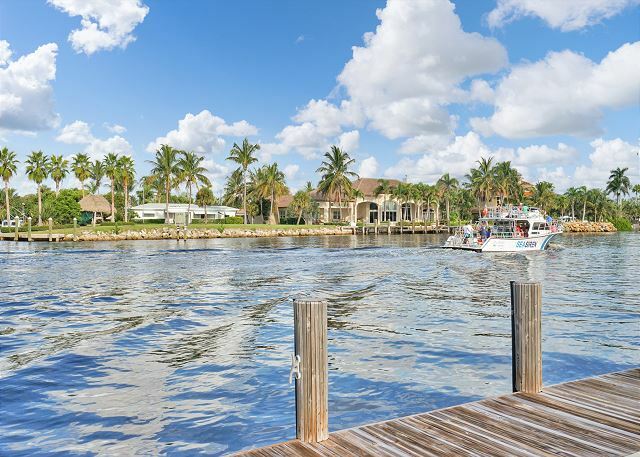 Watch the boats sail by on the Intracoastal Waterways. 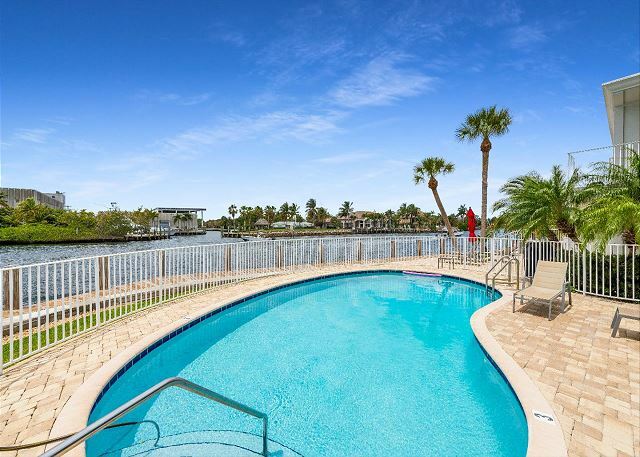 The pool offers a view of the Intracoastal Waterway. The pool seems to float over the water beyond. Grill your favorite fish or meat at the pool deck barbeque. Watch the boats go by while getting some sun with friends and family. A shaded landscaped path leads to the pool. 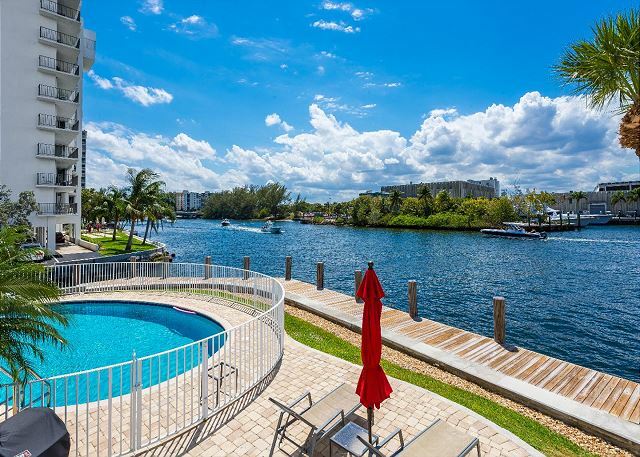 The shared pool floats over the Intracoastal Waterway. 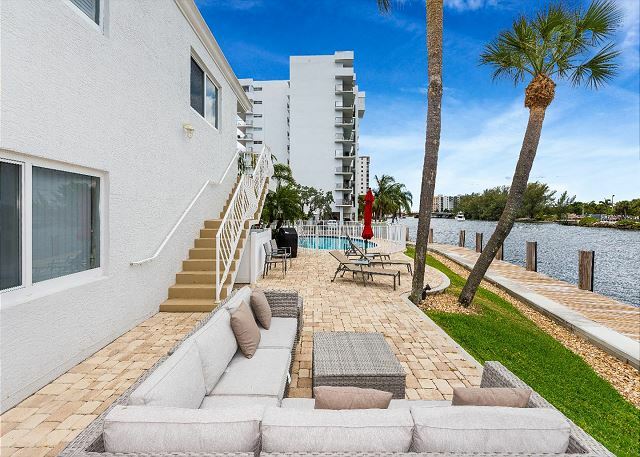 Plenty of chaise loungers to relax by the pool and gaze over the Intracoastal Waterway. Plenty of pool deck area for sunning and splashing in the pool. Grab your fishing rod and catch your fish for the day. Gaze over the Waterway and watch the sunset to the west. Sit and relax as the boats sail by the Waterways. 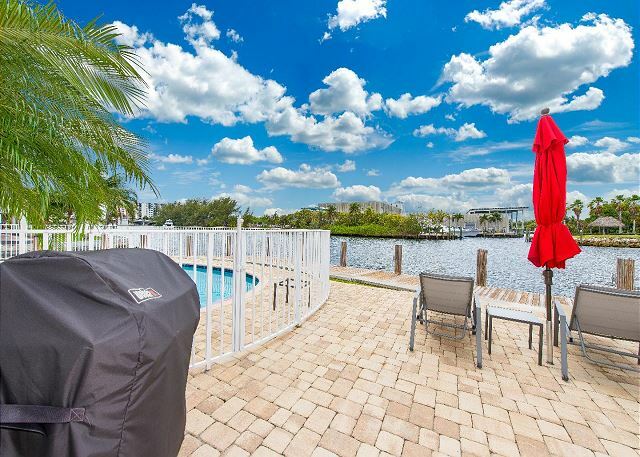 Dock your boat for $50/night at the 24' dock with water on the corner where the Intracoastal meets the finger canal. There is plenty of parking in the front of the vacation rental. 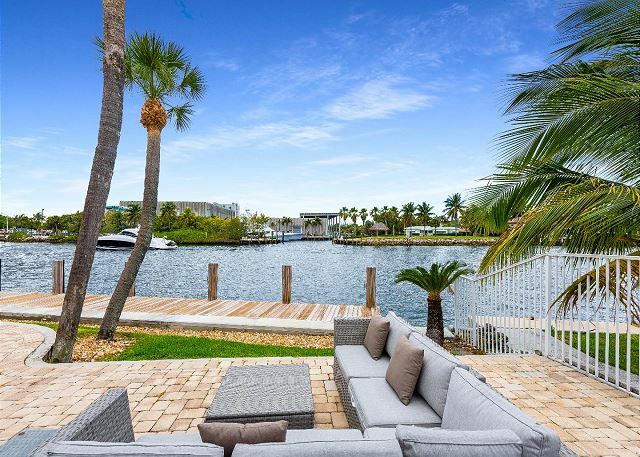 Invite your friends and family for a tropical drink overlooking the Intracoastal Waterway. 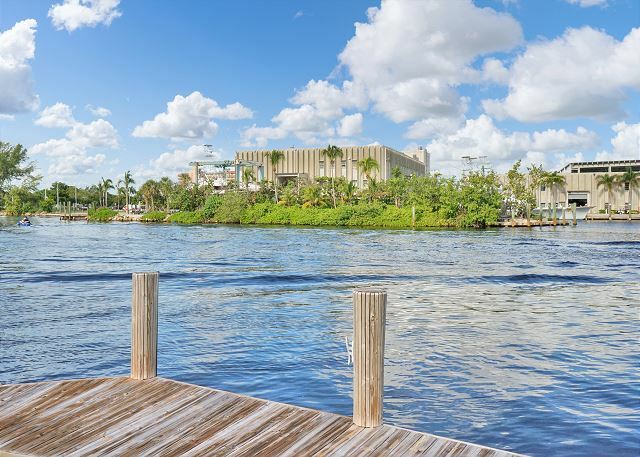 Even the entrance to the condo has an amazing view of the Waterway. 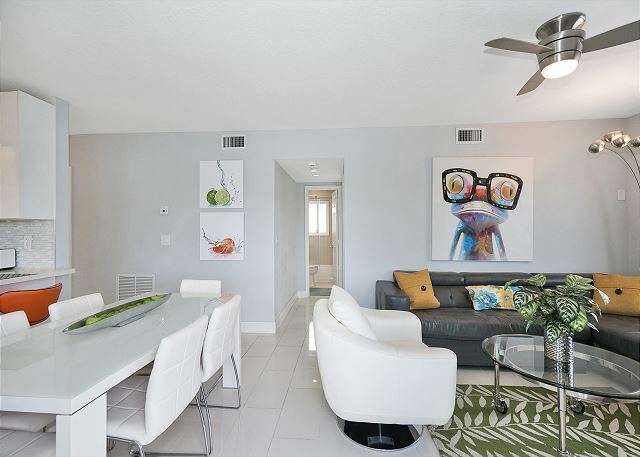 Inside AFFINITY Riverside Five, you’ll find cool, glossy floors, funky artwork, and a sleek, modern vibe. 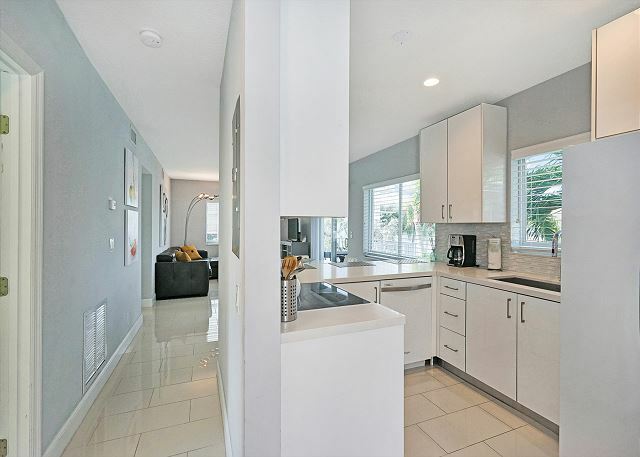 This luxurious, modern vacation rental offers breathtaking views of the water from every window and is the perfect spot for a pair of couples or small group of friends for your next Florida getaway. After dinner, retreat to the living area and stretch out on the leather sectional and chair. Or watch your favorite shows together on the 52” flat screen TV. 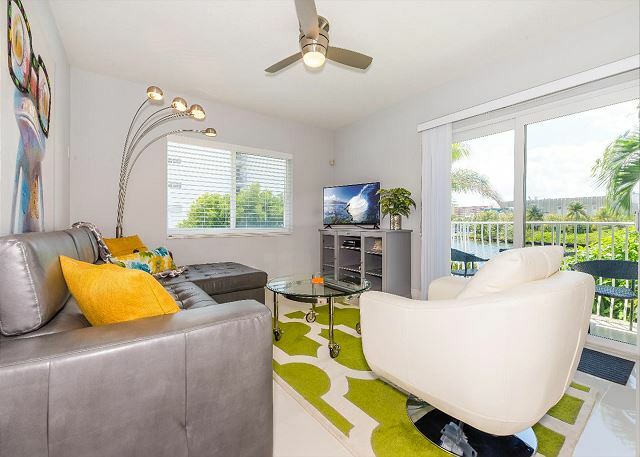 Just off the living room, you’ll find a balcony with two wicker chairs and a small table. 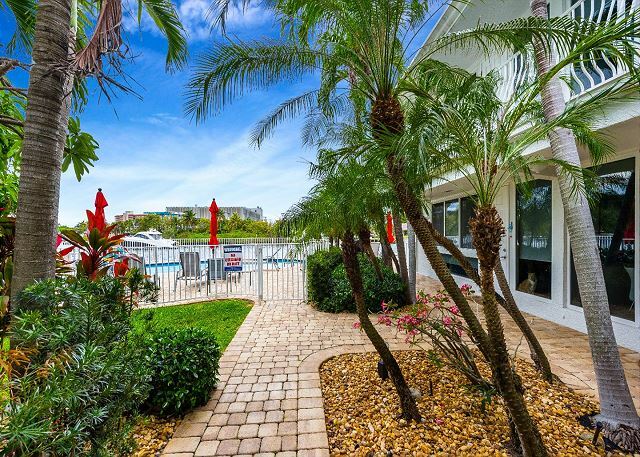 Unwind with your favorite book, or look out over the shared pool and the Intracoastal Waterway. 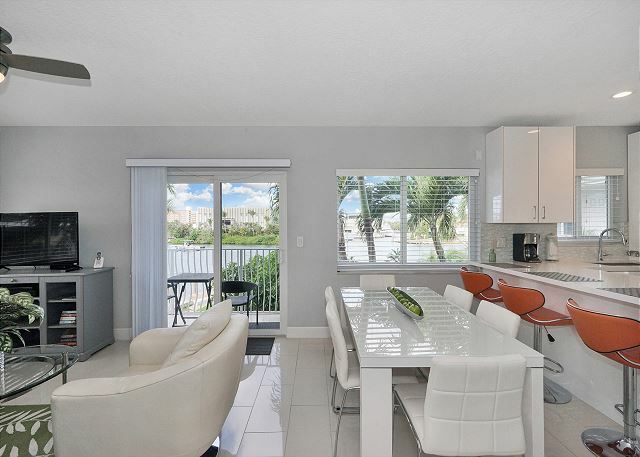 After building up an appetite frolicking at the beach, head over to the modern dining table (seats 6) and enjoy your favorite dish with friends and family. 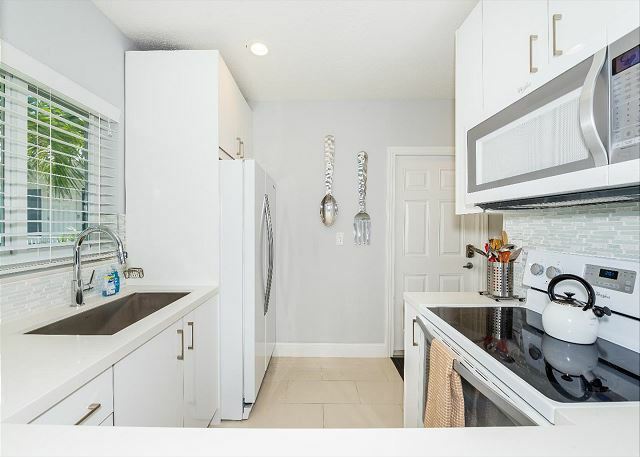 The updated kitchen has everything you need. 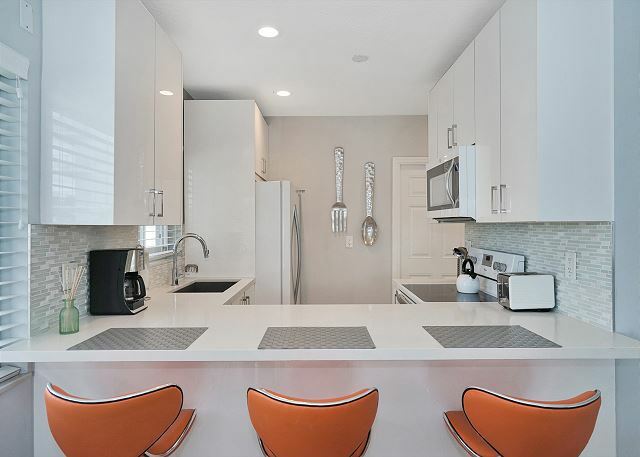 The sleek and stocked white cabinets, granite counters, and mosaic tiles create the perfect place for making group dinners—just add some fresh, local seafood and you’re all set. 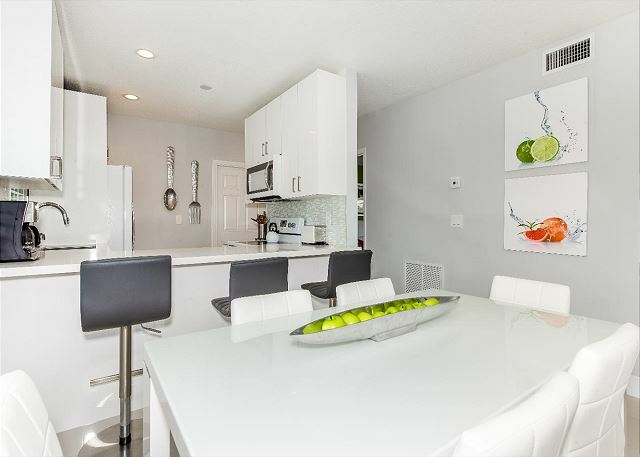 Grab a seat at the bar (3 stools) and enjoy a drink with the cook before dinner. 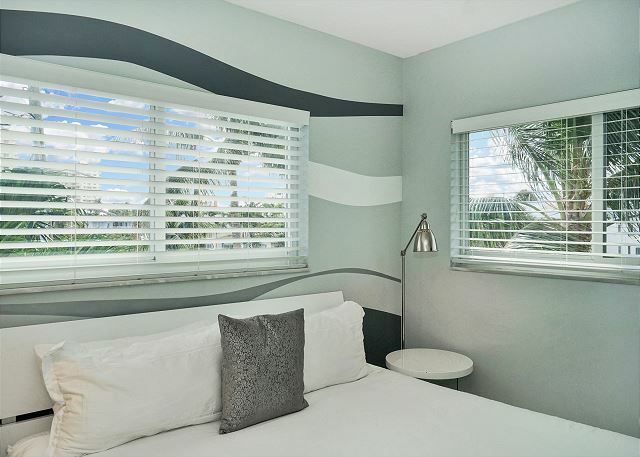 In the master retreat, you’ll find a king bed with luxurious white linens, 32” flat screen TV. The en-suite bathroom has a large walk-in shower. A sliding door leads to a private balcony (seating for 2). After a fun day in the sun, relax with a glass of wine, and watch the yachts glide along the canal. Your guest bedroom is bright and cheerful. 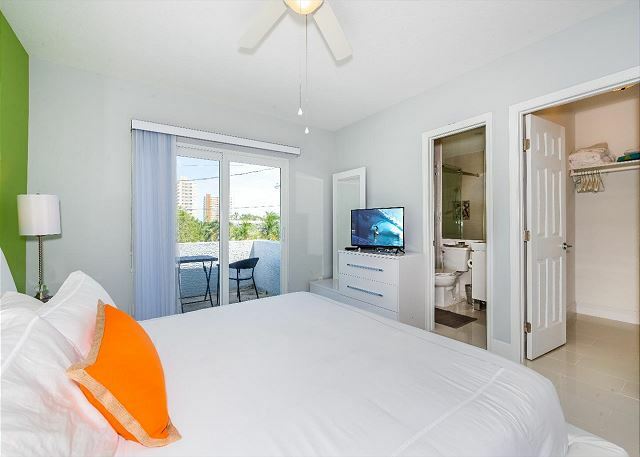 A guest bathroom with a tub/shower combo is located beside the guest room with king bed, 32” flat screen, and views of the sparkling water. 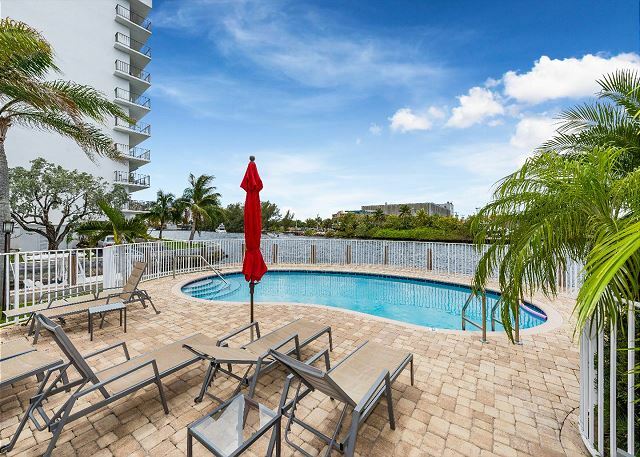 When you’re ready to cool off, head down to the sparkling pool and patio overlooking the Intracoastal Waterway. For something within walking distance, try Seaside Grill. The Rusty Hook Tavern and Sunset Catch are both about 6 minutes by car. Adventurers need to look no further than Life’s a Beach Watersports (6-minute walk) for all your Jet Ski, Paddle Board, and Kayak Rental needs. 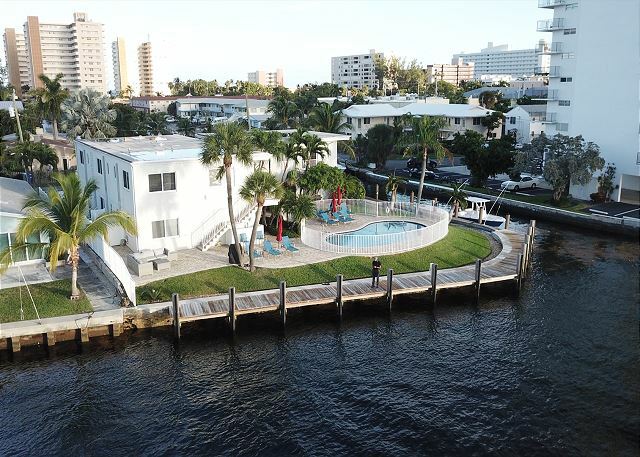 For scuba diving and snorkeling training, rentals, and charters check out South Florida Diving Headquarters, just 6 minutes by car. The apartment itself was beautiful, spotless and bigger then we had anticipated. The location was perfect for our family of 4. It was about 2 easy walking blocks to the beach and close driving distance to restaurants. We loved the pool and my husband enjoyed fishing off the dock. Also I need to mention that the woman we worked with to book the rental was so accommodating. She made sure I had a pack n play for my 1 year old and provided beach chairs, umbrellas and beach towels for our use. In addition she let us check in early and check out late because if our flight times. This hidden treasure is everything it advertises and more. 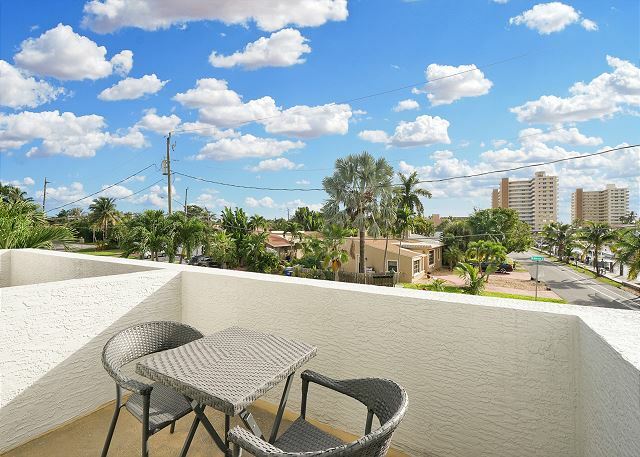 The location of Affinity Riverside Five is located facing the inter coastal waterway and only a block away from the beach where you can swim or watch the kite flyers on a breezy day. 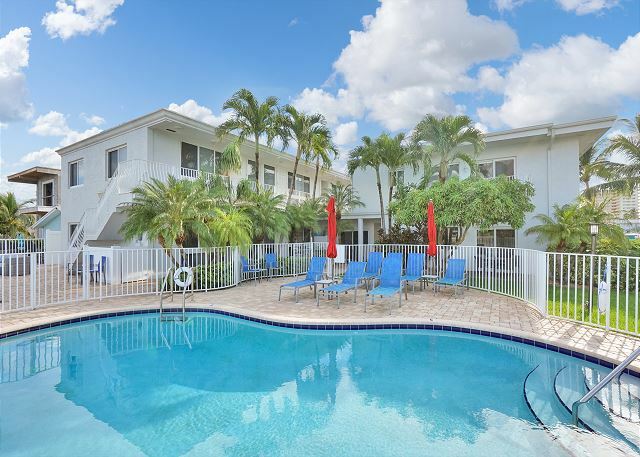 There is also a beautiful well maintained swimming pool with comfy couches along the patio. 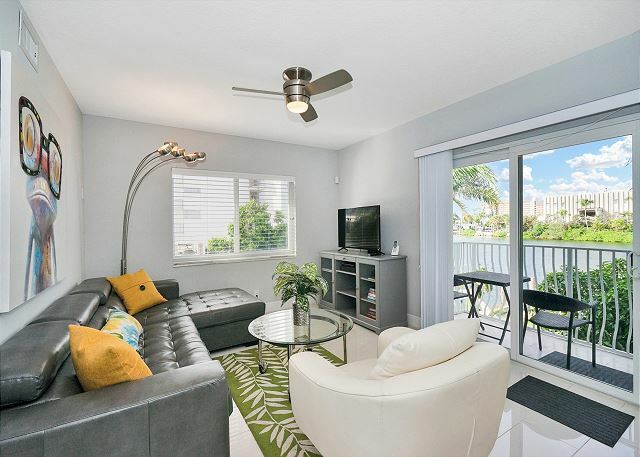 This unit has a cozy balcony that you can sit and watch the many boats that travel up and down.There are a few restaurants surrounding the area within walking distance. 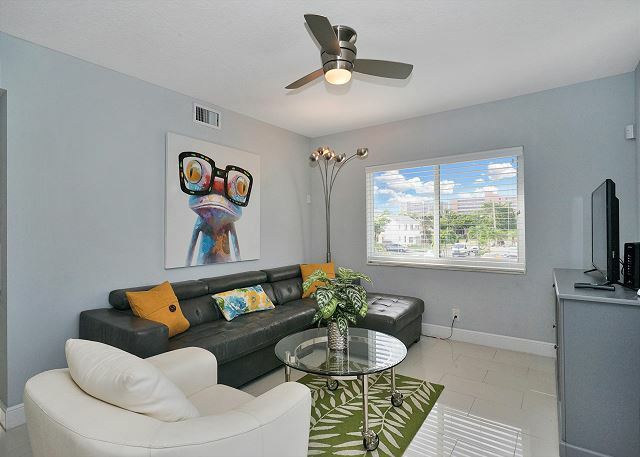 The property is extremely clean and well-maintained. We had some trouble with the lock to the front door and the property manager was there within a half hour. You can tell that they take pride in their property. I can't say enough about this amazing unit. It's my hidden treasure away from the cold and snow up north!